The domestic goat (Capra aegagrus hircus) is a subspecies of goat domesticated from the wild goat of southwest Asia and Eastern Europe. The goat is a member of the Bovidae family and is closely related to the sheep, both being in the goat antelope subfamily Caprinae. Female goats are referred to as does or nannies (or, less frequently, as mishas), intact males as bucks or billies; their offspring are kids. Castrated males are wethers. Goat meat from younger animals is called kid, and from older animals is sometimes called chevon, or in some areas mutton. The Modern English word "goat" comes from the Old English gat which meant "she-goat", and this in turn derived from Proto-Germanic *gaitaz (compare Old Norse and Dutch geit'(meaning' "goat"), German Geiß' ("she-goat") and Gothic gaits, ("goat")) ultimately from Proto-Indo-European *ghaidos meaning "young goat" but also "play" (compare Latin haedus meaning "kid"). The word for "male goat" in Old English was bucca (which survives as "buck", meaning certain male herbivores) until a shift to "he-goat" (and also "she-goat") occurred in the late 12th century. "Nanny goat" originated in the 18th century and "billy goat" in the 19th. Goats seem to have been first domesticated roughly 10,000 years ago in the Zagros Mountains of Iran. Ancient cultures and tribes began to keep them for easy access to milk, hair, meat, and skins. Domestic goats were generally kept in herds that wandered on hills or other grazing areas, often tended by goatherds who were frequently children or adolescents, similar to the more widely known shepherd. These methods of herding are still used today. Historically, goat hide has been used for water and wine bottles in both traveling and transporting wine for sale. It has also been used to produce parchment, which was the most common material used for writing in Europe until the invention of the printing press. Goats have horizontal slit-shaped pupils, an adaptation which increases peripheral depth perception.. Because goats' irises are usually pale, the pupils are much more visible than in animals with horizontal pupils but very dark irises, such as sheep, cattle and most horses. Contrary to this reputation, they are quite fastidious in their habits, preferring to browse on the tips of woody shrubs and trees, as well as the occasional broad leaved plant. However, it can fairly be said that goats will eat almost anything in the botanical world. Their plant diet is extremely varied and includes some species which are toxic or detrimental to cattle and sheep. This makes them valuable for controlling noxious weeds and clearing brush and undergrowth. They will seldom eat soiled food or contaminated water unless facing starvation. This is one of the reasons why goat rearing is most often free ranging since stall-fed goat rearing involves extensive upkeep and is seldom commercially viable. For instance, the intestine is used to make "catgut", which is still in use as a material for internal human sutures. The horn of the goat, which signifies wellbeing (Cornucopia) is also used to make spoons etc. The taste of goat meat is similar to that of lamb meat; in fact, in some parts of Asia, particularly India, the word "mutton" is used to describe both goat and lamb meat. However, some feel that it has a similar taste to veal or venison, depending on the age and condition of the goat. It can be prepared in a variety of ways including stewed, curried, baked, grilled, barbecued, minced, canned, or made into sausage. Goat jerky is also another popular variety. In India, the rice-preparation of mutton biryani uses goat meat as its primary ingredients to produce a rich taste. "Curry goat" is a traditional West Indian dish. Nutritionally, goat meat is healthier than mutton as it is lower in fat and cholesterol, and comparable to chicken. It also has more minerals than chicken, and is lower in total and saturated fats than other meats. One reason for the leanness is that goats do not accumulate fat deposits or "marbling" in their muscles; chevon (goat meat) must ideally be cooked longer and at lower temperatures than other red meats. It is popular in the Middle East, South Asia, Africa, northeastern Brazil, the West Indies, and Belize. Chevon, as yet, is not popular in most western nations, though it is among the fastest growing sectors of the livestock industry in the US. Other parts of the goat including organs are also equally edible. Special delicacies include the brain (where legal) and liver. The head and legs of the goat may be smoked and used to prepare unique spicy dishes and soup. 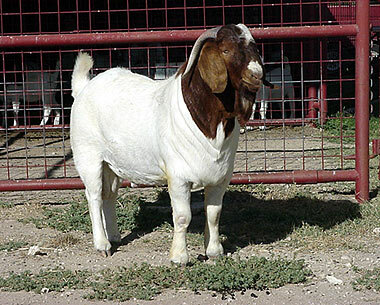 One of the most popular goats grown for meat is the South African Boer, introduced into the United States in the early 1990s. The New Zealand Kiko is also considered a meat breed, as is the Myotonic or "fainting goat", a breed originating in Tennessee. 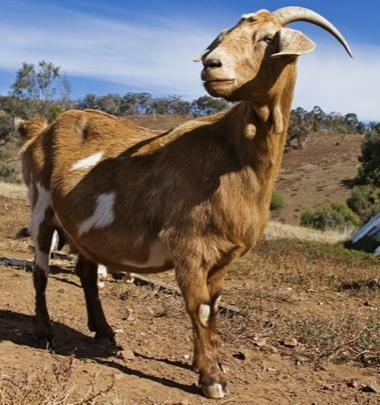 Some goats are bred for milk, which can be drunk fresh, although pasteurization is recommended to reduce naturally occurring bacteria such as Staphylococcus aureus and Escherichia coli. If the strong-smelling buck is not separated from the does, his scent will affect the milk. Goat milk is commonly processed into cheese, goat butter, ice cream, cajeta and other products. Goat milk can successfully replace cow milk in diets of those who are allergic to cow milk. However, like cow milk, goat milk has lactose (sugar) and may cause gastrointestinal problems for individuals with lactose intolerance. It also contains a form of Casein, a Protein in all Mammal's milk. Goat's milk is naturally homogenized, which means the cream remains suspended in the milk, instead of rising to the top, as in raw cow's milk. If the milk is kept scrupulously clean, it can be drunk raw, greatly improving the benefits. Many dairy goats, in their prime, average 6 to 8 pounds of milk daily (roughly 3 to 4 quarts) during a ten-month lactation, giving more soon after freshening and gradually dropping in production toward the end of their lactation. The milk generally averages 3.5 percent butterfat. A doe may be expected to reach her heaviest production during her third or fourth lactation. They also state that "formula derived from goats' milk is also unsuitable for babies who are lactose intolerant as it contains similar levels of lactose to cow's-milk-based infant formulae." Goat butter is white (compared to yellow butter from cow's milk) because the goats produce milk with the yellow beta-carotene converted to a colorless form of vitamin A. Goat cheese is known as chèvre in France, after the French word for "goat". Some varieties include Rocamadour and Montrachet. Feta is a well-known Greek variety that may be made with a blend of goat and sheep milk. Some goats are bred for the fiber from their coats. 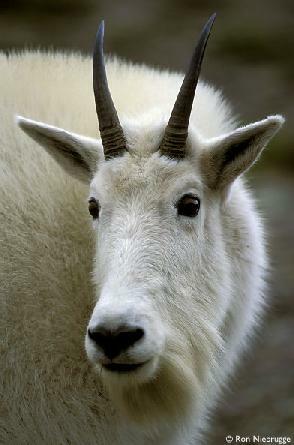 Most goats have softer insulating hairs nearer the skin, and longer guard hairs on the surface. The desirable fiber for the textile industry is the former, and it goes by several names (mohair, fleece, goat wool, cashmere, etc., explained below). The coarse guard hairs are worthless as they cannot be spun or dyed. The proportion and texture varies between breeds, and has been a target of selective breeding for millennia. The Cashmere goat produces a fiber, cashmere wool, which is one of the best in the world. It is very fine and soft. Most goats produce cashmere fiber to some degree, however the Cashmere goat has been specially bred to produce a much higher amount of it with fewer guard hairs. Goats do not have to be slaughtered to harvest the wool, which is instead sheared (cut from the body) in the case of Angora goats, or combed, in the case of Cashmere goats. However, the Angora goat usually gets shorn twice a year with an average yield of about 10 pounds while the Cashmere goat grows its fiber once a year and it takes about a week to comb out by hand, yielding only about 4 ounces. The fiber is made into products such as sweaters and doll's hair. Both cashmere and mohair are warmer per ounce than wool and are not scratchy or itchy or as allergenic as wool sometimes is. Both fibers command a higher price than wool, compensating for the fact that there is less fiber per goat than there would be wool per sheep. In South Asia, cashmere is called "pashmina" (from Persian pashmina, "fine wool") and these goats are called pashmina goats (these well-fleeced animals are often mistaken for sheep). Since these goats actually belong to the upper Kashmir and Laddakh region, their wool came to be known as "cashmere" in the West. The pashmina shawls of Kashmir, with their intricate embroidery, are very famous. The Best Little Goat Ranch in Texas!